The round brilliant is the most popular diamond cut. Because of its popularity, assessment of this cut has been the subject of considerable research. Courtesy of Harold & Erica Van Pelt. Ask anyone what the most important characteristic of their diamond is and they’re likely to say it’s the “Wow” factor. You want your friends and family to stop, stare and admire the stone dancing on your finger or from your ears. Carat weight, color, clarity, and let’s face it, price, help you decide which diamond you like best, but you might not understand how your diamond’s cut – how its facets and angles are cut and polished − affects its overall appearance – its “Wow” factor. A beautifully finished (cut) diamond is dazzling; every facet displays the craftsman’s skill and care. When it interacts with light, each facet and angle affects the amount of light returned to the eye. This is what gives a diamond its face-up appearance and what makes it appealing – or not. That is why for many people, cut is the most important of the 4Cs − the system developed by GIA to describe a diamond’s quality. Those four factors – color, clarity, cut and carat weight – are the basis of the International Diamond Grading System that GIA created in the early 1950s as the universal standard of diamonds. The GIA Cut Grading System, introduced in 2005 and validated by thousands of observations by retailers, manufacturers and the public who looked at real diamonds and described why they thought certain diamonds were the best looking, can help you understand what to look for in a well-cut diamond. The GIA Cut Grading System applies to the most popular cutting style – the standard round brilliant – and all clarities across the D-to-Z color range. There are five cut grades: Excellent (EX), Very Good (VG), Good (G), Fair (F) and Poor (P). A diamond with an Excellent cut grade is very bright. It shows an even pattern with good contrast between light and dark areas, so the reflections appear crisp and well-balanced. This tells you that the cutter made the best possible use of the rough. The Good cut grade diamond isn’t quite as bright – reflections aren’t as sharp and there’s more darkness or dullness in the diamond. The Poor cut grade diamond has much more prominent dark areas or dullness. Given the choice, most people would pick either of the first two diamonds instead of this stone. 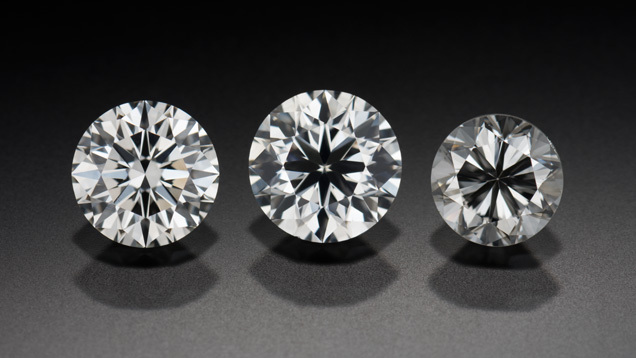 If you look at the photo above, you can see how diamonds with Excellent, Good and Poor cut grades, from left to right, compare to each other. If all else is equal, an Excellent cut grade pretty much guarantees an extremely attractive diamond. Diamonds in the Very Good and even Good cut grades are also beautiful; they only suffer by comparison with the very best stones. 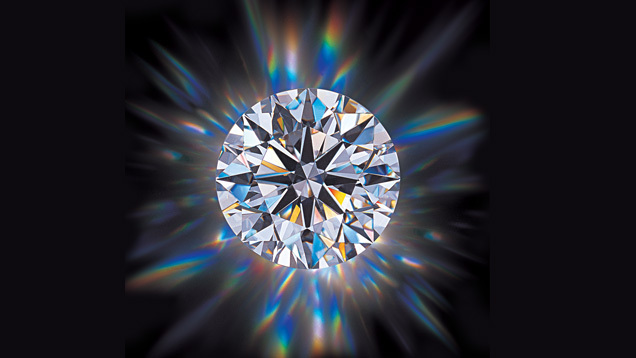 Brightness – often called brilliance – is the effect of all the diamond’s internal and external reflections of white light, best observed under diffused lighting. Well-cut diamonds are brighter than poorly fashioned ones, even if they’re of equivalent size, color and clarity. In general, the brighter a diamond is, the higher its grade will be. Fire results when white light traveling through the diamond is dispersed into its rainbow of spectral colors. Look for red, blue, yellow or orange flashes as you rock and tilt it under store spotlights. Scintillation is a combination of sparkle and pattern. Sparkle refers to the spots of light that flash when the diamond, you or the light source moves. In an attractive diamond, the reflections should appear even and balanced in size. Pattern is the relative size, arrangement and contrast of bright and dark areas that result from a diamond’s internal and external reflections. There must be enough contrast between the bright and dark areas to give the pattern a crisp, sharp look, but no distracting dark areas. The whole is greater than the sum when it comes to a diamond’s proportions, which are the dimensions and angles of a polished diamond’s facets and how they relate to one another. There is no set “formula” or set of proportions that result in a perfectly cut diamond. All of the numbers you might have heard other people referring to – table size, crown angle, pavilion angle – work together to create the spectacular stone sitting in front of you. That’s one of the surprising things GIA researchers discovered in the course of the 70,000 observation tests they conducted as they developed the cut grading system. There are a range of proportions that fall within each cut grade, and each specific diamond within that grade may look slightly different in terms of attributes like brightness, fire or pattern. For this reason, a specific stone may be more appealing to one customer than another, even though both may perform equally well. The GIA system places more emphasis on the overall appearance of the diamond, as opposed to any single set of proportions. Your eye sees those proportions working together – for better or worse – when you look at a diamond face-up. Dark areas in the center, under the table or around the girdle could mean that the shape of the rough forced some compromise. Conversely, bright, even patterns signify a cutter’s attention to detail and precision. The GIA system downgrades diamonds that carry excess weight in extremely thick girdles, steep crowns or deep pavilions. Diamonds with features that make them vulnerable to damage – like extremely thin “knife-edge” girdles – also tend to receive lower GIA cut grades. Carefully observe diamonds that have high cut grades. They are often a little different from each other; you may even prefer a diamond with a lower cut grade. One last tip: A grading report used in conjunction with your own visual observation will confirm what your eye is seeing. But, ultimately, beauty is in the eye of the beholder, so make sure you pick out a diamond that is most appealing to you. GIA began issuing reports that included a cut grade for round brilliant diamonds in 2006.